projects+gallery is thrilled to lead a series of citywide exhibitions and activations in St. Louis, Missouri from September through November 2018 in partnership with For Freedoms, a platform founded by activist artists Hank Willis Thomas and Eric Gottesman in 2016 to foster dialogue about race, art, education, advertising and politics in the United States. “For Freedoms” is a twist on President Franklin Delano Roosevelt’s notions of four universal freedoms: freedom of speech and expression, the freedom to worship, freedom from want, and freedom from fear, which inspired a series of paintings in 1943 by Norman Rockwell. Organized by projects+gallery founder, Susan Barrett and independent curator, Modou Dieng, For Freedoms kicks off the week of Sept. 17 with three artist-designed billboards ascending in various locations throughout the city, two months ahead of the US midterm elections. Designed by Hank Willis Thomas, Michele Pred and Derrick Adams – and located just north of downtown in a far west suburb and off the major interstate I-44 – the billboards encourage civic discourse in the most public format during a time of political urgency. Most notably, Thomas’ billboard places the reactionary expression “All Lives Matter” – which has been used to discredit the Black Lives Matter movement – in white text over a black background with the letter “v” omitted to read “All Lies Matter,” revealing the divisive nature of the “All Lives” mantra. On October 18, Cry of Victory and Short Walks to Freedom will open at projects+gallery. Featuring fourteen artists of various disciplines, the exhibition celebrates creative gestures as small, yet impactful victories in the context of a dire political administration that is actively cutting funding for the arts. Together, each artists’ work provides a renewed sense of optimism and the potential for dialogue, progress and change. Furthermore, pieces in the exhibition by Kwame Brathwaite date from 1965, bridging contemporary and past struggles. 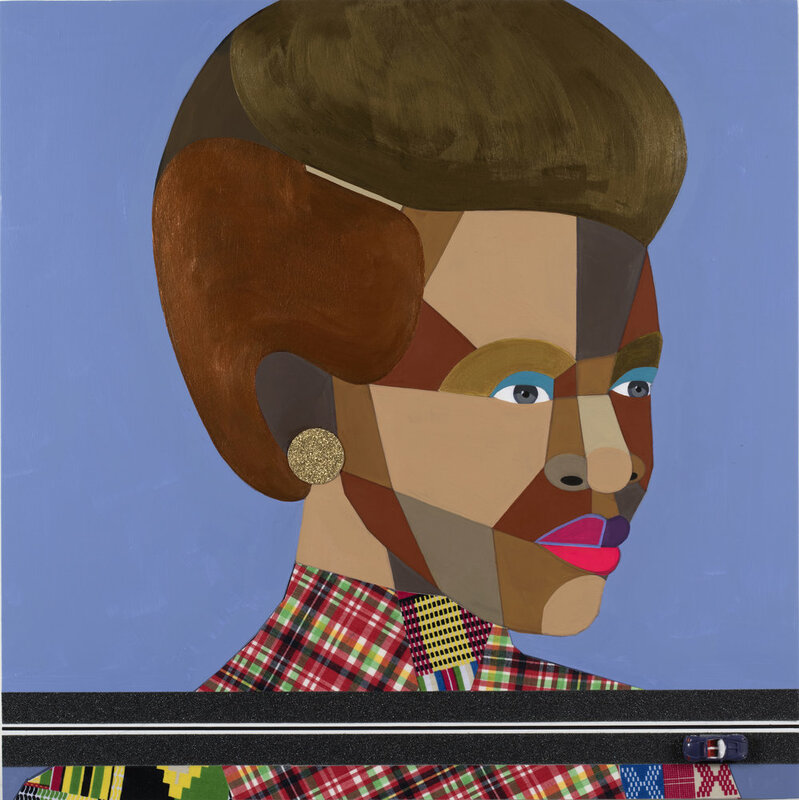 Cry of Victory and Short Walks to Freedom will feature artists Derrick Adams, Kwame Brathwaite, Bunny Burson, Jen Everett, Shabez Jamal, Rodolfo Marron III, Fabrice Monteiro, Esmaa Mohamoud, Alexis Peskine, Michele Pred, Aram Han Sifuentes, Xaviera Simmons, Hank Willis Thomas and Kennedy Yanko. For the duration of the citywide activations this fall, projects+gallery will spearhead educational outreach for creating interactive lawn signs for public display throughout the city, organized in collaboration with The Contemporary Art Museum St. Louis, The Pulitzer Arts Foundation, The St Louis Art Museum, Center of Creative Arts (COCA), St. Louis University, Washington University, University of Missouri St. Louis and Webster University. Participants are encouraged to design and produce signs that say, “Freedom Of ___,” Freedom To ___,” “Freedom From ____” and “Freedom For ___,” marking their own definitions of, and responses to FDR and Norman Rockwell’s historical Four Freedoms. Signs featured citywide will also be on display at projects+gallery through the run of Cry of Victory and Short Walks to Freedom. Modou Dieng was born in Saint-Louis, Senegal. He is a multidisciplinary artist and curator exploring the symbolic and mythological power of pop culture icons through mixed media and hybrid materials. His work constructs a mural of archetypal cultural imagery filtered through the perspective of a split identity between Blackness and Western Philosophy. Dieng has exhibited internationally and is the co-founder of Blackpuffin a curatorial team based in Chicago. Dieng holds an MFA from the San Francisco Art Institute. ABOUT THE 50 STATE INITIATIVE Since 2016, For Freedoms has produced special exhibitions, town hall meetings, billboards, and lawn sign installations to spur greater participation in civic life. This year, For Freedoms launched its 50 State Initiative, a new phase of programming to encourage broad participation and inspire conversation around November’s midterm elections. Building off of the existing artistic infrastructure in the United States, For Freedoms has developed a network of over 300 artists and 200 institutional partners who will produce nationwide public art installations, exhibitions and local community dialogues in order to inject nuanced, artistic thinking into public discourse. Centered around the vital work of artists, For Freedoms hopes that these exhibitions and related projects will model how arts institutions can become civic forums for action and discussion of values, place, and patriotism.